Jetty is a 3-year-old red brindle female with a broken hock and severe ulcerations on her foot. 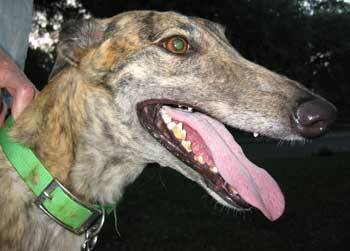 Jetty raced at Valley Race Park and suffered her break in the last several weeks. She and Sadie were taken from Harlingen to Victoria. From there they were picked up by Angel, Sarah's mom, and taken back to Austin where GALT volunteer, Jo, took them to College Station for surgery. Jetty is now recuperating in the same foster home as Pete, and is an easy, calm girl who gets along well with everyone. Her cast will be on for at least 6 to 8 weeks. Jetty's cast has been taken off and she is doing well. She is definitely a Velcro greyhound, and would climb up in your lap in a minute! She likes children and is very sweet and affectionate. Jetty is small animal and cat tolerant.